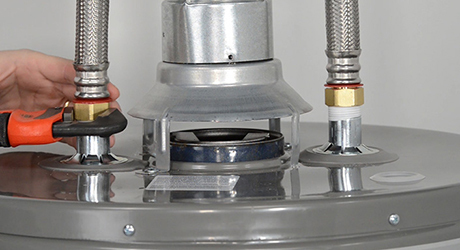 Gas water heaters require a gas supply, a cold water supply and a flue connection to carry away harmful gases. Learn more about the process of installing one of these units in this guide. Safety: The Home Depot highly recommends that you hire a professional to install your water heater. Our services are available for same-day installation when you call before noon in most areas. Schedule an appointment today. Turn off the water and gas supply. Attach a garden hose to the drain valve and empty the tank. Turn on a hot water faucet to allow air into the system. Disconnect the gas line using two pipe wrenches -- disconnect the gas line at the union fitting if the pipe is galvanized, or at the flare fitting if the gas supply line is copper. 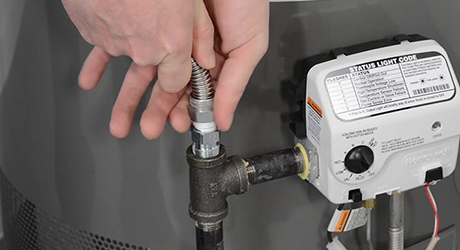 Using two adjustable wrenches or pipe wrenches, disconnect the water lines above the tank. If the piping has been soldered into place, use a hacksaw or tubing cutter to cut the pipe. Make sure the cuts are straight. 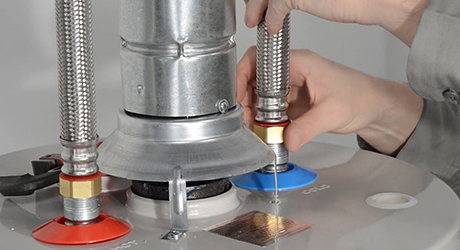 Remove the screws connecting the vent to the water heater using a screwdriver or nut driver. 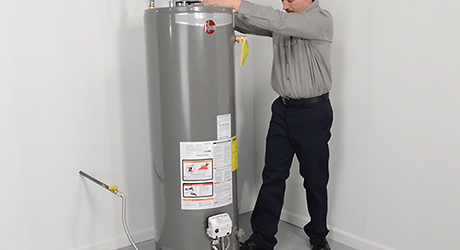 Remove the old water heater – you may require help for this because older water heaters fill with sediment and are heavier than new ones. 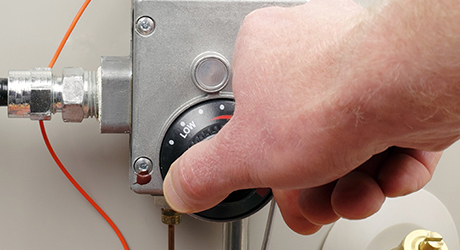 Install the water heater in an area with at least 6 inches of clearance on all sides for ventilation. Allow unobstructed access to the burner and controls. Place a carpenter’s level on the side of the water heater and level it with plastic shims if necessary. 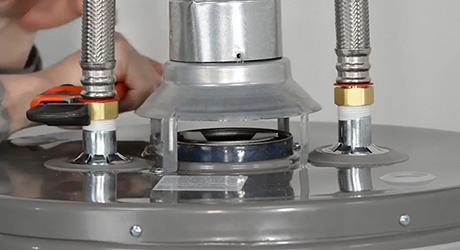 Reconnect the flue hat to the gas exhaust vent. 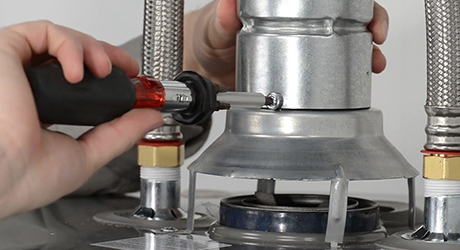 Wrap the water heater heat trap fitting pipe threads using Teflon tape. These fittings are directional and must be installed properly -- both have arrows showing the correct direction for installation. 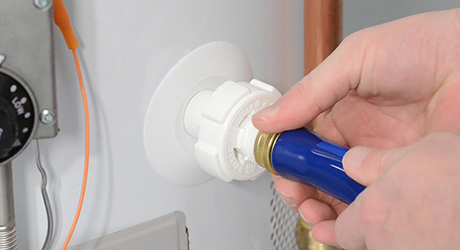 Attach the blue-coded fitting to the cold water inlet with the arrow facing into the water heater. 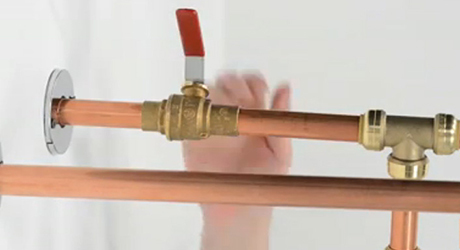 Attach the red fitting to the hot water outlet with the arrow pointing away from the water heater. Tighten using a pipe wrench or adjustable pliers. Measure and cut the water line connections to length. Before connecting the gas line, clean all threads with a wire brush and rag. Apply piping compound to the threads of the black pipes as you connect them. Install the union fitting last because it connects the new line to the existing line. When finished, open the gas supply valve and turn the water on. Turn on water at the tank, then turn on one or more hot water faucets to bleed air out of the system. Fill a sponge with a mixture of liquid dishwashing soap and water, and apply it to the new fitting. Check for bubbles. Test all connections. 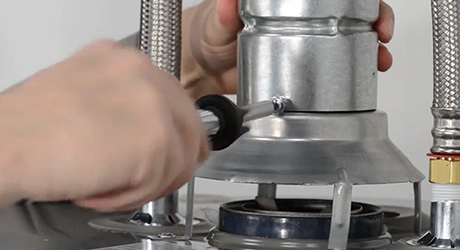 If there's a leak, bubbles will form on the surface and you'll have to refit the joint. Remove the burner access panel. Turn the knob on top of the control box to the pilot position. Hold a lit fireplace match or barbecue lighter to the pilot access opening. Press and hold down the reset button on the control box for 60 seconds after the pilot ignites. Turn the knob on top of the control box to the On position -- you should hear the burner ignite. If it doesn't, remove the access panel and relight the pilot.